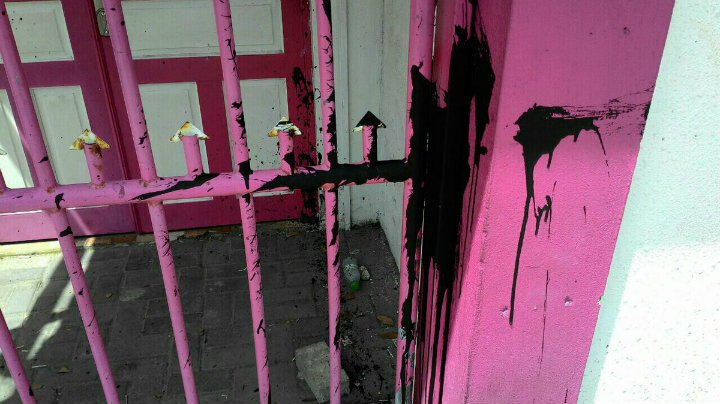 Used motor oil was thrown on the gates to the PPM headquarters at Thema, days after the building was ransacked and insulting graffiti was found on its inner walls. The ruling party’s former headquarters was vandalised Thursday, days after the building was cleared out by President Abdulla Yameen’s supporters, who have since been accused of scrawling anti-Maumoon Abdul Gayoom graffiti on its walls. An unknown group or person is said to have thrown used motor oil on the gates to the Progressive Party of the Maldives’ former headquarters at Henveiru Thema on Thursday morning. The attack came after Gayoom, Yameen’s half-brother and former president of 30 years, published photos of insults and swear words that were scrawled on Thema’s walls. “This is what was written on the walls after PPM’s offices were broken into,” Gayoom said in a Twitter post accompanied by a photo of the graffiti. A police spokeswoman said the motor-oil incident is under investigation, but said the police were not aware of the graffiti that was scrawled on the building’s inner walls. 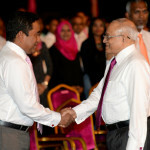 The Gayoom brothers are locked in a bitter war for the control of the ruling party. 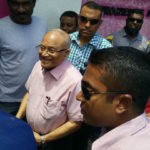 Yameen’s supporters cleared out the PPM headquarters on October 28, after the supreme court endorsed a verdict that stripped Gayoom of his powers as elected leader of the party and put the incumbent president in charge. Riot police had set up barricades in the area, blocking Gayoom supporters from entering the building as Yameen’s supporters moved all of the furniture, computers and documents to a new office at the Dharubaaruge convention centre. Later in the week, Moosa Zameer, the tourism minister and deputy leader of Yameen’s faction, attempted to hand over keys to the building’s owner, who refused to accept them. The landlord only opened the office in the presence of Gayoom faction officials and the press on Wednesday. “Legitimate PPM got our office premises back today. But mere walls. 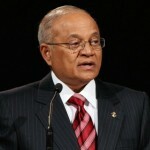 All our office equipment had been taken away,” Gayoom said in a Twitter post. Other insults scrawled on the walls include Golhabo, a derogatory term used against Gayoom by opposition supporters, and swear words. A picture of a smiling Gayoom against a wall daubed with the words, “Goru Handaa,” which roughly translates into piss off, has gone viral on social media. Abdul Aleem, the secretary general of the Gayoom faction, has accused Yameen supporters of vandalism. One of the few items left in the office included a portrait of Gayoom, which used to be hung on the walls of all government buildings and schools during his 30-year presidency. The Gayoom faction has set up offices at Thema once again. The Yameen faction has denied the allegations of vandalism. “I can assure you that no one supporting President Yameen would write such insults against President Maumoon. 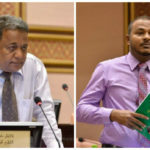 From the looks of it, it looks like it was done by people pretending to support President Maumoon… They may have tried to get sympathy or support for President Maumoon by saying these things were written by supporters of President Yameen,” MP Abdulla Khaleel told the press. Gayoom’s daughter, Yumna Maumoon, meanwhile said she hoped the police would be able to identify the vandals from surveillance cameras in the area. The police had previously published a video of a man suspected of having defaced a billboard of the president, located in front of the party headquarters. 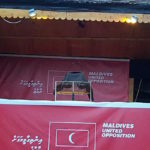 Used motor oil attacks is a common tactic used against the opposition in the Maldives, but no one has been prosecuted over the multiple attacks on the opposition headquarters or that on the homes of opposition leaders.